Sleek, durable aluminum options to make your message last! These metal covers offer durabability for a truly unforgettable book. Our Alloy covers are made from the highest grade, heavy-gauge aluminum with smooth edges and an anodized finish that resists scratching. Ideal for embossing and screen-printing, and engineered to be both lightweight and durable. Price includes Aluminum front cover with black chipboard back cover. 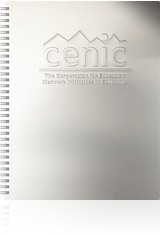 Also includes embossed imprint up to 16” sq or 1-color silkscreen. Setup fee of $85 G. Actual pre-production sample available for $85 G. Standard turnaround 7-10 business days.